My mended heart project is started with a light hesitation, nothing as strong as resistance. What’s concerning to me at the moment is that I don’t know if I can do it well, do a good job. Yet I trust Charlene as My Mended Heart Guide and we begin. Before I know it, I’m wondering where the day went! Clearly, I am not the first student of the Mended Heart process. Charlene is cool as a cuke and is leading me through all the steps with precision order. I’ll need to choose a ready-sewn heart from the stacks and stacks available. Right away I’m wondering: how do you get the stuffing inside? I find out I’ll have to cut open the heart to stuff it! Wow. Chills. I’m already feeling the magic–that didn’t take long. 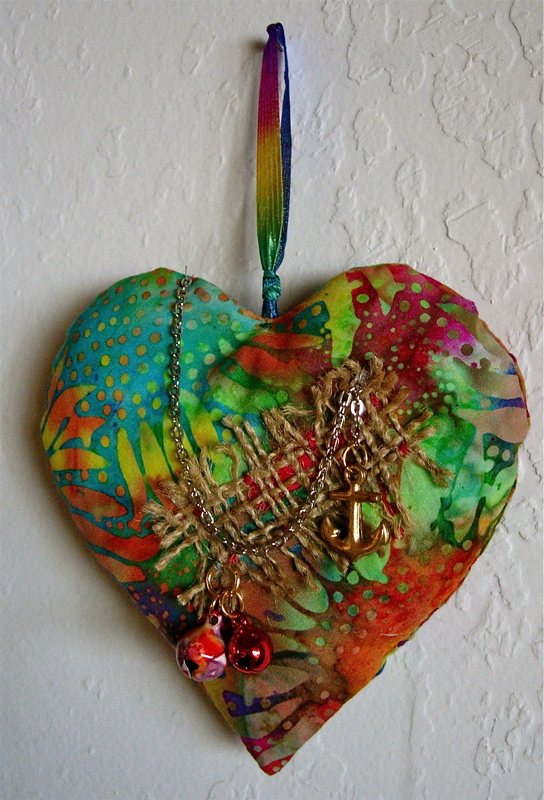 Without too (terribly) much difficulty I’ve chosen this colorful, kind of wild, batik style heart. I select a yummy red fabric as the patch material and add the stuffing. Using a chopstick, I make sure to get the tip nice and pointy–the stuffing soft and even, not lumpy. Now on to the findings. There are really way too many choices. Good thing I’ve reviewed the dozens of finished hearts that Charlene has on hand. She watches for that sparkle in my eye and it helps her narrow down my options. I start with a wee bit of burlap and a length of silver chain. Don’t remember how many ooohs and aaahs I spewed out over her basket of everything wonderful odds-n-ends, but it was a lot. This box is over 15 years worth of collecting, some of the odds are very odd and some of the beads are handmade by Charlene. Now that I’ve pawed through the box for a while, a nautical theme is emerging–seahorses, fish, shells. Again, tooooooo many choices! I never even get to the towers of seed beads that are in my peripheral vision the entire time. What I choose is just an anchor and two bells. Charlene graciously waxes my threads so I can sew. And she engineers my jump ring situation so the bells will hang just right. At this point Charlene tries three times to get my attention to show me something and I hear nothing, so intent am I on the stitching of the burlap to the heart. Ta da. It looks good, just… Charlene politely offers that if I want to, I can sew down the anchor to prevent it from hanging backwards. Nah, I say, just let it swing, no problem. Without missing much of a beat, I casually say that we could glue two anchors back-to-back. Oh, we are both so relieved! Apparently, we’d like for it to not bug us if it hangs backwards but in our hearts we know it will. Too funny, right? Anyway, now we’re down to the hanger and apparently I am too tired to choose one (have I mentioned the many many choices?). Charlene chooses for me a perfect hanger and I promise to finish at home. So I’m home. I’m looking at it. Liking it. But it doesn’t make sense. Do I really need to understand this? Yes. I’m wondering why I have the burlap completely covering the red fabric that I love so much. My first thought is to reinforce the red stitching as a way of bringing the inside out. No. Here comes the ah ha: what if the solution is not to add something–but to create the mending by taking excess away? Yes. Pulling out every other thread from the burlap gives it a looser weave that allows a hint of the red to show through. From across the room I don’t notice the mending at all. A person must look closer to see that. I notice the happy colors, the strong chain. An anchor for moveable security. Bells to sing out that I have a mended heart, although I can’t sing, hence the bells.